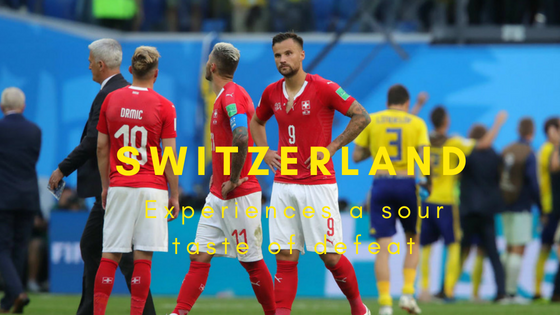 Switzerland, a strong competitor in the tournament of FIFA 2018 had to face the taste of defeat as they were beaten in the last 16 of another major tournament and this it was 1-0 by Sweden. The obvious event caused frustration for Swiss as they conceded the only goal of the match just when it looked as though they might take the lead. Although there have been several speculations as to why there has been a failed performance from the Swiss’s side, one thing that remains vague is why Switzerland did not seriously attempt to restrict Emil Forsberg as they did with Neymar against Brazil. The RB Leipzig man was in the notice of Sweden’s play throughout the game and had plenty of time and space for the goal, despite the fact that his shot took a fortunate deflection off Manuel Akanji. Djourou felt that It was a frustrating goal to concede and a tough one to accept. The Swiss international footballer thinks that they played better than Sweden and are “solid” but the glitch lies in linking up. Josip Drmic had his own nations about the game and puts forward his opinion. He said that there was no way past Sweden once they scored and that it was an absolute checkmate. However, the team and its leaders aren’t devoid of hope and expectations. They know that in the time to come they would make their mark in the world and win the tournament. Yann Sommer seemed to have a hard time to put his emotions into words. As he did, he said that it was absolutely disappointing as they were desperate to reach the quarter-final. But never the less, he cheered up after a point and said something that restored our faith. It was the fact that sometimes it’s the little things that decide a game, but one must never lack the inspiration to win. Stay tuned for more news and information on FIFA world cup 2018.